Winter in Japan is coming! Often spring is considered to be the best time to visit Japan, but some claim that actually winter is the best season to visit this amazing country. Why? 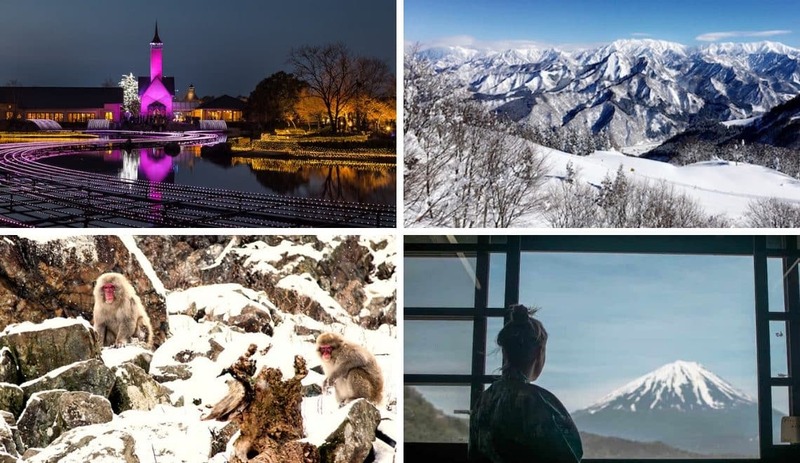 Well, there are countless of reasons to visit Japan in winter: winter sports, snow monkeys, dips in hot springs, winter illuminations and snow, just to name a few! Also, during the winter it tends to be a lot more quiet in Japan, meaning less crowds at iconic Japanese spots. In this guide to your winter experience in Japan you can find useful information for your visit, with loads of inspiration such as top things to do and places to visit. I also asked fellow travel bloggers about their favourite activity in Japan during the wintertime and included them in this article. From the Jigokundani snow monkeys to enjoying the winter illuminations, and from bathing in a onsen full of red wine to skiing in Japan. You’ll definitely have lots of fun during this special winter trip in Japan! 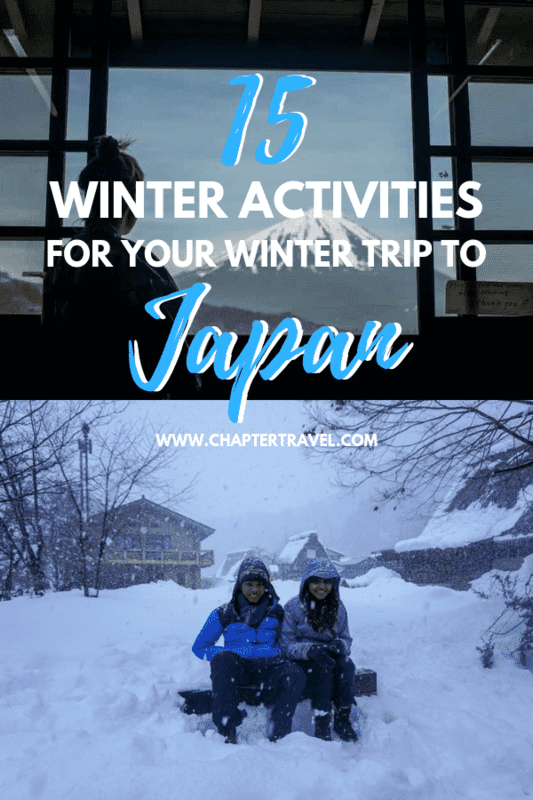 Click here to jump to 15 fun winter activities for your trip to Japan! So, when does winter start in Japan?! Officially the winter starts in December and runs until February. But not every part of Japan is a true winter wonder land; it really depends which part of the country you’ll go to. Winter temperatures in Japan: What kind of weather can you expect? During the winter in Japan the weather is usually very clear, crisp and pleasant. The climate of Japan varies across the country, because the country is a collection of islands that stretch out over thousands of kilometers. So, next to the season that you’ll be visiting Japan, it really depends on the specific place in Japan what type of weather you can expect. Big cities on the mainland of Japan, such as Tokyo and Osaka, generally don’t have a lot of snowfall. In Tokyo, the temperatures in winter are around 2 – 12 degrees Celsius. If you head into the mountainous regions and Northern parts of Japan, the temperatures start to drop and the winters can be cold with lots of snow. For instance, the northern island on Hokkaido, the Japanse Alps and the Japan Sea coast get a lot of snow. Of course you have to come prepared for your winter trip to Japan and make sure you’re all warm and cosy with the right gear. Like I mentioned above, it really depends on the exact place that you’ll be going in Japan how cold it will be. What really helps is to layer your clothes. If you’re wearing various layers you can always take something off when it gets too hot. Below you can find some essentials that are worth buying for your winter trip to Japan. You can click on the links to shop. Go here for more tips on what to pack for Japan. Kairo are heating pads that can warm up your hands and feet from the cold. In Japan you can purchase these at any convenience store or supermarket. The above photo is an example of a kairo pack. Of course you can already purchase them beforehand, but it’s not necessary. Buy the Kairo Hot pad 10pcs from Japan here. Get a good jacket to keep yourself warm outside, whether you’re on the mainland or in Northern parts of Japan. Check out various insulated jackets here. Inner wear is that extra layer that can give you the warmth you need. Here you can find warm innerwear. It’s quite annoying if you have to grab something and you’re wearing mittens. If you’re going for practical, wear gloves. Even better are fingerless gloves, so you can easily use your camera and phone to snap photos. Check out these fingerless gloves. Buy some warm and cosy socks for Japan, as you often have to take off your shoes in Japan. So keep your toes warm with some warm winter socks. Buy these cosy winter socks. Even on cloudy, cold days your skin can be damaged by the sun. Especially if you’re going skiing your skin is exposed to harmful UV rays. So be sure to pack enough sunscreen to protect your precious skin. Below you can find lots of inspiration for your time in Japan during winter!. Walking through the park to get to the natural hot spring where the snow monkeys are often seen, is a great hike through the woods on a well-maintained path. It’s possible to see the monkeys coming in through the trees as you walk, but once you arrive and see them in this magical wintry landscape, it’s a surreal experience. I thought there would only be a few monkeys, but the family that routinely visits the park has over 100 members, and you can see monkeys of all ages. There is nothing cuter than two juveniles playing on the rocks, chasing each other. Well, until you spy the babies clinging to their mothers as they peer at you with big eyes! With the snow coming down, people snapping pics, and monkeys frolicking in and out of the hot water, it’s just not something you would expect to be real. It’s amazing. Written by Corinne Vail of Reflections Enroute. In my mind, there’s no better way to escape the Japanese winter chill than visiting a local onsen. However, they aren’t all created equal. Yunnessun onsen in Hakone gives you probably a once in a life time chance to swim in many different types of hot pools. 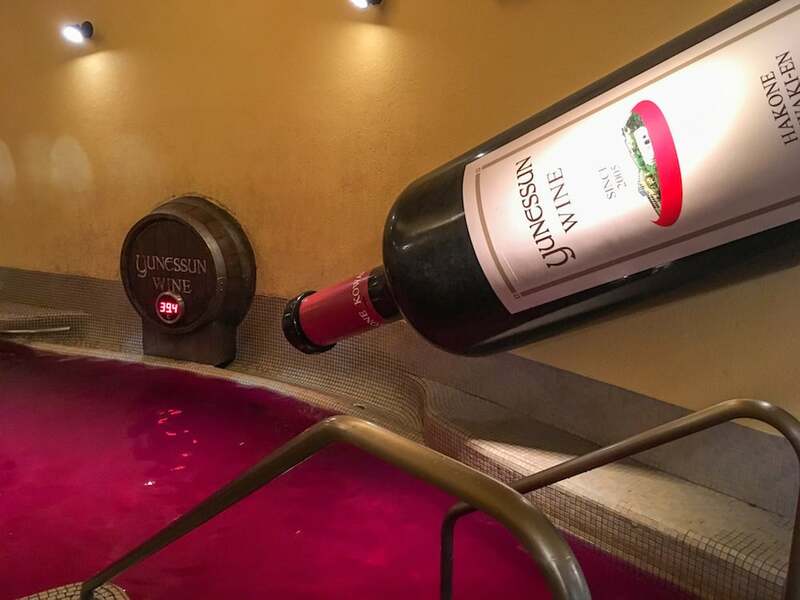 Red wine is poured into one of the baths and sits just under 40 degrees Celsius. While swimming in wine felt slightly wrong, there were many other unique heated pools of water. Green tea and sake are another two popular stops. While coffee and syrup flavored waters are also at Yunnessun, there’s something to suit everyone’s taste. To get away from the stranger attractions of Yunnessun, there’s an outside area with water slides and regular onsens here with a great view of Hakone. This area of Yunessun is clothed unlike most other onsens in Japan, and be warned, you will have to take up every single visible tattoo. If you’re after a unique and unforgettable Japanese onsen experience, head to Yunnessun! Mount Fuji is the highest mountain in Japan and one of the country’s most iconic landmarks. Did you know that winter is actually the best season to see Mount Fuji?! If you want a high chance to see the mountain, then the winter months are a good bet. When it’s winter in Japan the visibility tends to be better than during summer in Japan due to clean and cold air. Read more about Mount Fuji. The Sapporo Snow Festival takes place annually in the capital city of Hokkaido, and is probably one the best known winter attractions in all of Japan. So when travelling recently on a JR Pass in Honshu, we insisted on travelling by Shinkansen, to cross the Seikan Tunnel to the island of Hokkaido, specifically to experience it. 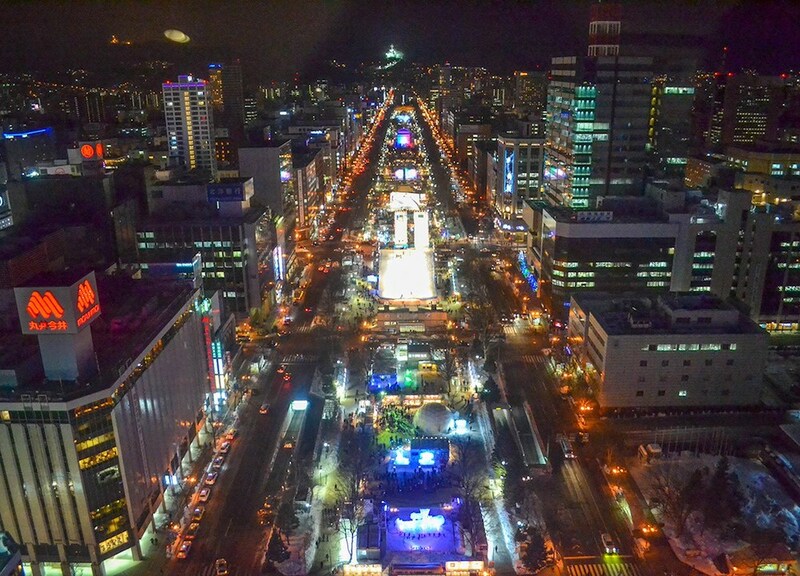 And while we only had 24 hours in total for the Sapporo Snow Festival, which did feel rushed, we also managed to cover two of the main sites (there are 3 in total), while focussing mostly on the main arena at Odori Park (Ōdōri Station). One of the highlights here was undoubtedly the views over the festivities from the observation deck at the Sapporo TV Tower. But it was otherwise just fascinating to explore the maze of sculptures, as there were around 300 plus in total in the park, with special events held at the bigger monuments with light-and-sound shows. Written by Allan Wilson of Live Less Ordinary. 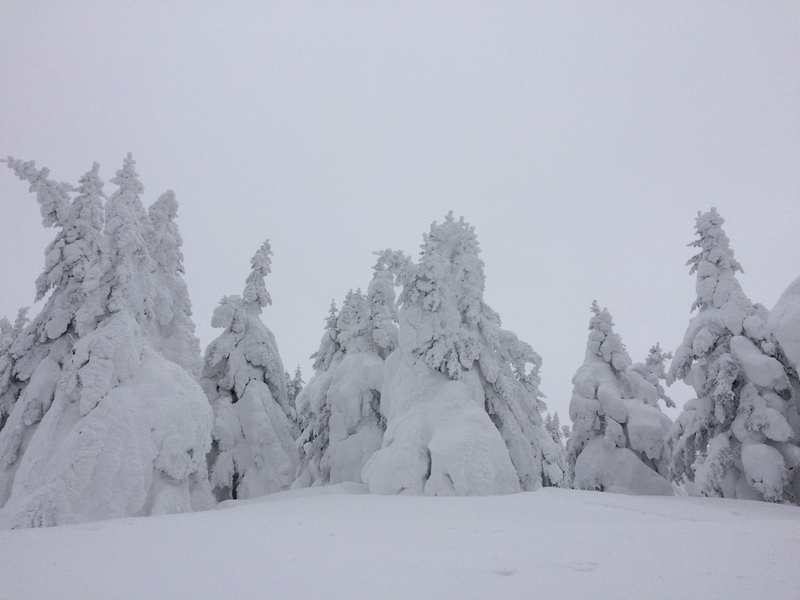 Every year when the winter is coldest in the northern parts of Japan, the Snow Monsters form at the top of the highest peaks at Zao Onsen Ski Resort in Yamagata Prefecture. The strong and icy cold winds form thick layers of ice and snow at every tree, covering them completely. It is eery skiing or snowboarding between the trees especially when it is foggy, and you can’t see further than a couple of meters. But the vast shapes are also beautiful when it is sunny. 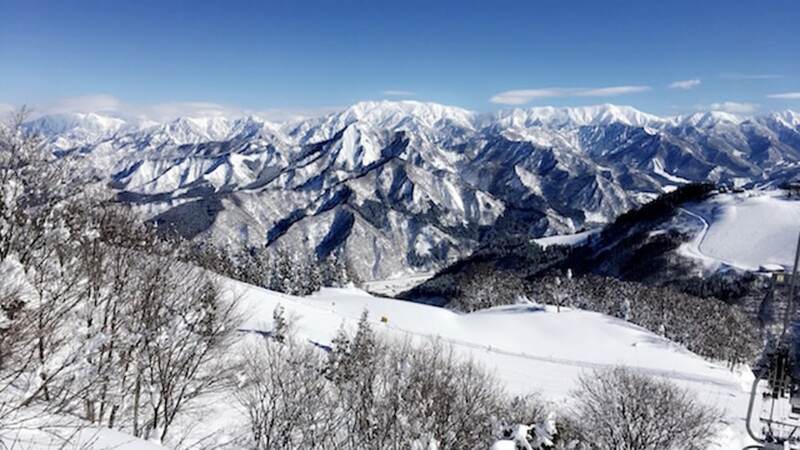 If you aren’t interested in skiing, no problem, Zao Onsen has lot’s to offer besides a day on the white slopes. 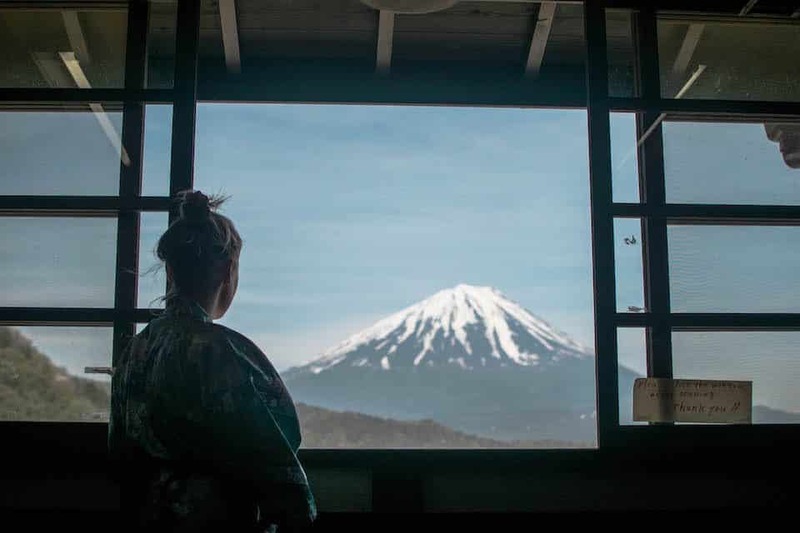 Enjoy your time at one of the public hot springs, called Onsen in Japanese, try some of the delicious food famous in the region, like Zunda Mochi, or merely take the ropeway to the top of the mountain to hike between the Snow Monsters. Written by Lena of The Social Travel Experiment. Kinosaki Onsen, on the northern coast of Honshu prefecture, is one of the most famous places in Japan to visit an onsen. The town exists because of the hot springs, and there are plenty of places you can soak in the hot water. The baths are divided by gender and you shower before entering the baths. Winter is my favourite time to visit, because here are several outdoor onsen. Sitting in hot water, surrounded by snow (or even better, when it is actually snowing) is a magical experience. Kinosaki is a beautiful town, centered around a canal lined with willow trees. In addition to the onsen, there are many ryokan (traditional Japanese inns) to stay in. It’s common to get dressed in a yukata (a simple traditional robe, somewhat similar to a kimono, but very casual and worn by men and women) and geta, traditional wooden slippers, and walk around town from one onsen to another. Ryokans all supply yukata and geta and you will not be alone. Of course, in winter, you will also need a coat. Kinosaki in winter is a highlight of any trip to Japan! Written by James Ian of Travel Collecting. Yuzawa, located in a section of Niigata Prefecture often referred to as the Japanese Alps, is one of the country’s largest ski and snowboarding areas. Yuzawa is known for a long ski season, often running from November to March, and for having a very deep champagne powder. This has spawned the growth of almost 20 ski resorts in the area, ranging from those with a single lift to the largest having 30 lifts. The most popular resort in Yuzawa is GALA, which is easily accessed because there is a Shinkansen (bullet train) station inside the resort. A ride from Tokyo to GALA takes less than 1.5 hours. The more adventurous may want to try Kagura Resort, where the backcountry lift is said to lead to bottomless powder. Yuzawa has all of the other amenities and attractions expected in a resort town, from beginners lessons to onsens to relieve tired muscles after a long day on the slopes. The season is also celebrated with a vibrant winter festival, with various performances and food stalls throughout the town. Written by Roxanna Keyes of Gypsy with a day job. Behind Nara Park you can find the old, extinct volcano called Mount Wakakusa. From here you have a wonderful view of Nara. During Spring, the mountain is covered by grass and cherry trees. As winter approaches, the grass begins to die and the cherry trees lose their leaves. Wakakusa Yamayaki is an annual festival, whereby the grass on the hillside of Nara’s Mount Wakakusayama is set on fire and this can be seen throughout the city. After the burning of the mountain, fireworks take place. It’s a whole spectacle and one of the biggest winter festivals in the Kansai region. 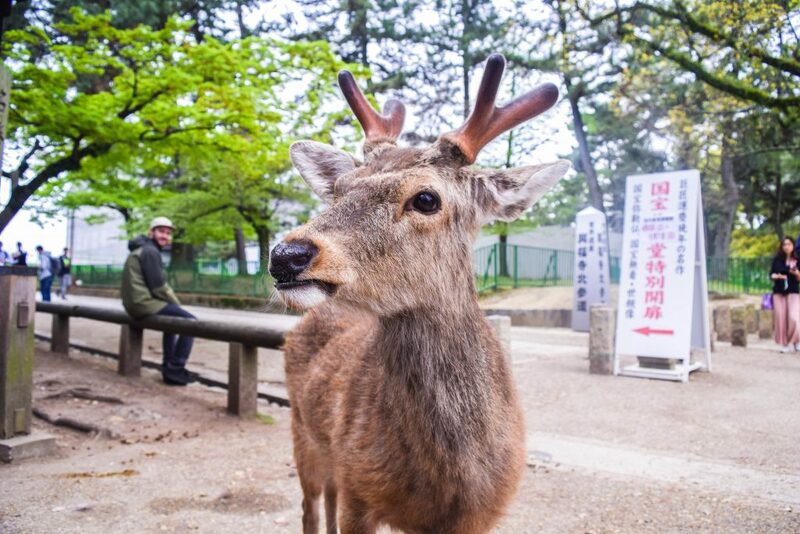 Read more about Nara in this post! I visited Koyasan in early January and was happy to find the weather quite mild. 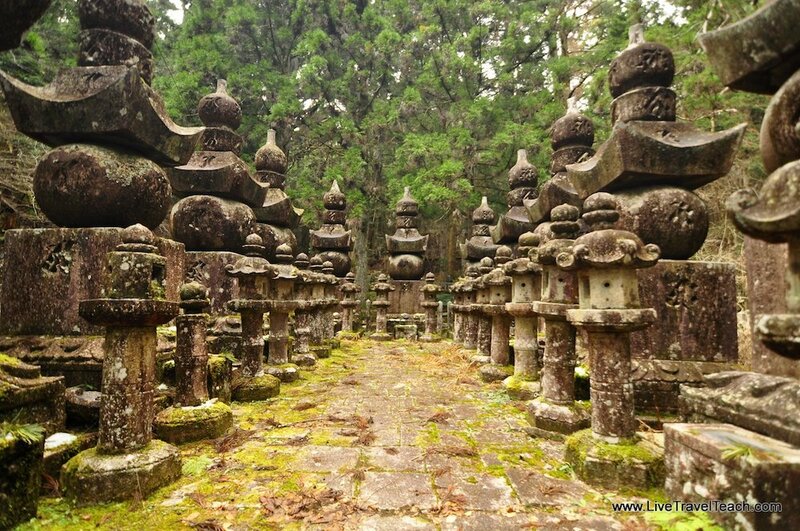 Koyasan is the home of Japanese buddhism and a beautiful forest filled with over 200,000 ancient graves. An archaic graveyard might sound spooky but the whole region is incredibly beautiful with the gravestones painting a verdant scene. You can visit Koyasan any time of year but the nice thing about being there won’t be as many tourists. Head there as a day trip from Kyoto or spend the night in one of the local lodges. There are plenty of monasteries and temples for you to explore or you can simply enjoy hiking through the nearby mountains. Koyasan is a UNESCO world heritage site and famous throughout Japan as founding birthplace of Shingon Buddhism. Walking through the path you’ll find plenty of devout monks who are happy to assist a wandering nomad like me or a family visiting Japan for these wintery months. Written by Mike Still of Live Travel Teach. 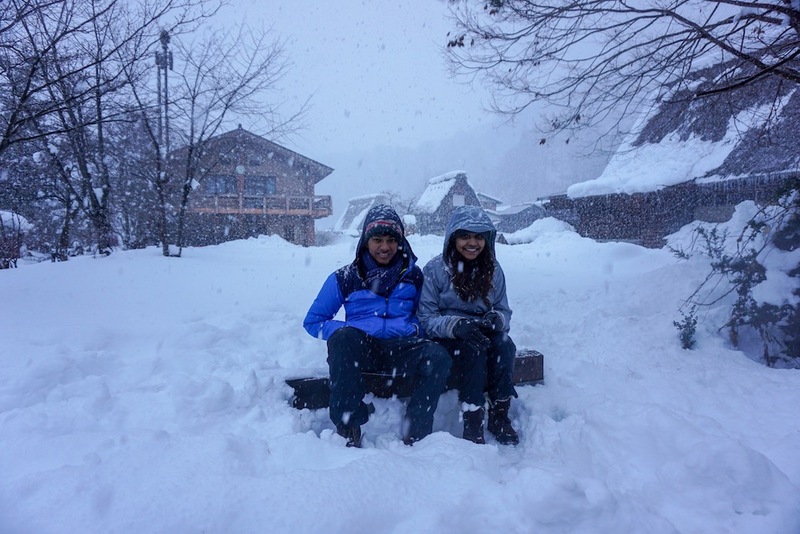 If you are going to be in Japan during winter you can’t miss the Japanese Alps, especially Shirakawago. It is a long trip from Nagoya but worth it. Make sure to bring snow pants and jackets since snowfall is almost guaranteed. Snowfall in this region can get pretty intense and Ogimachi village in particular usually gets covered in 1 to 2 meters of snow, making the town into its own unique winter wonderland. After we got down from the bus, we crossed the bridge over the calm Shokawa River leading us to the reason why we came here – the Ogimachi village famous for its unique gassho-zukuri buildings. Gassho-zukuri is a unique architecture style special for the Hida district of Japan (inland in the mountains). They are steep straw-roofed homes made of wood. Due to harsh and unforgiving winters with a lot of snow, the roofs of the houses are steeply angled to prevent the snow from piling up. After a tour of the houses and making snow angels warm up with some hot chocolate in the cafe. Written by Priya of Outside Suburbia. A fun and popular way to enjoy winter festivities in Japan is to attend an illumination event. Each winter, cities and gardens around Japan are decked out in splendid light displays. From hillsides covered in lights, decorated trees, lit up buildings, and choreographed light shows, there are many dazzling exhibitions sure to impress. 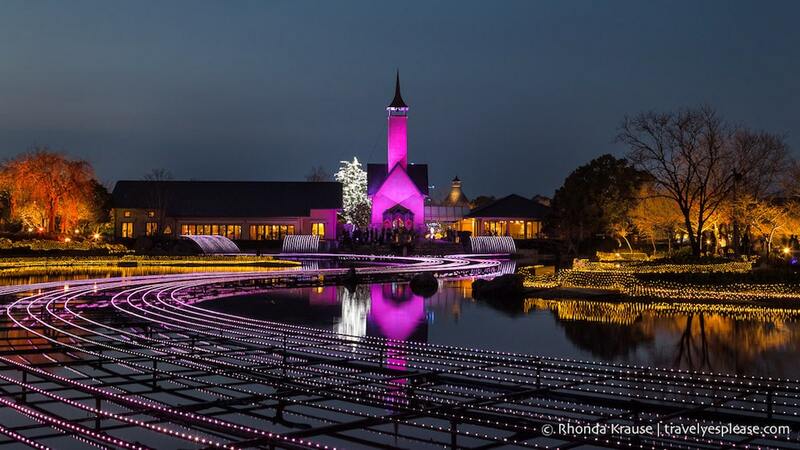 One of the largest illumination events is at Nabana no Sato flower park, near Nagoya. There are millions of LED lights decorating the park but the main attractions are the light tunnels and animated light show (which has a different theme every year). There’s even an observation deck that rises above the park, giving a panoramic view of the lights. Winter illuminations are typically displayed between November and December, but some start as early as October and stay up until spring. Written by Rhonda Krause of Travel Yes Please. This photo is taken at German Christmas Market. Unfortunately I didn’t have the pleasure to visit a Japanese Christmas market myself (yet)! You can visit Christmas markets in the big cities of Japan, such as Tokyo. 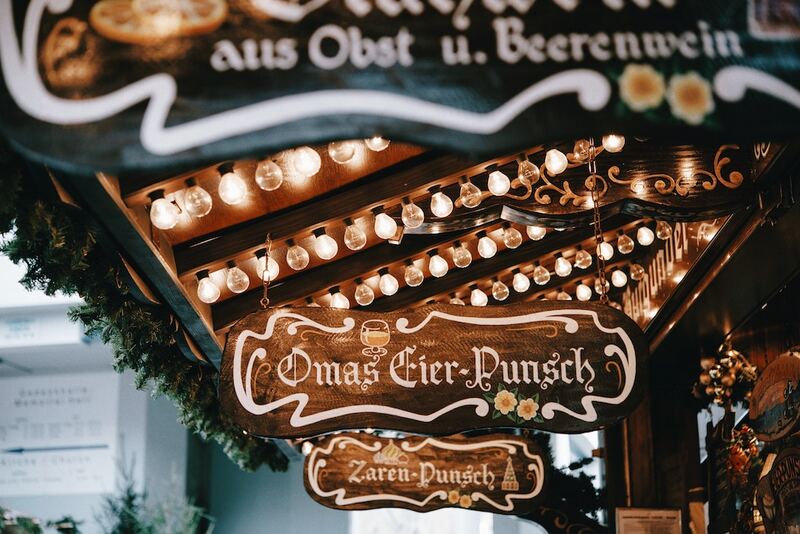 At these cute Christmas markets you can do the same as at European Christmas markets: drink gluwein, beer, eat pretzels and explore the pretty stalls. Some of the most popular markets are Yokohama Akarenga Christmas Market, Tokyo Christmas Market at Hibiya Park and Tokyo Skytree Solamachi Christmas Market. Hatsumode is the first Shinto shrine visit of the Japanese New Year. This cultural tradition happens around early January on the first, second or third day of the year. During Hatsumode you can make wishes for the new year, buy new charms (called omamori) and return old ones to the shrine to be burned. Everyone is welcome to take part in this Japanese tradition! 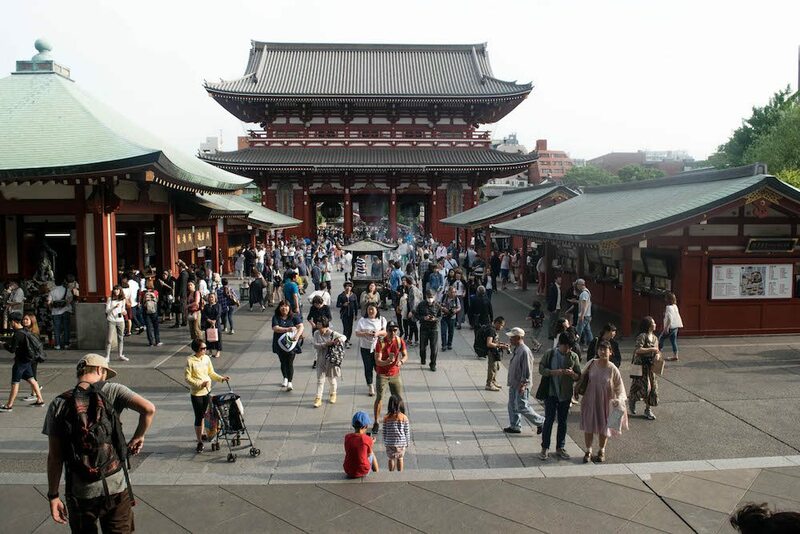 A popular temple to have this experience is Sensō-ji, an ancient Buddhist temple in Asakusa, Tokyo. Winter in Japan brings a lot of different dishes, mostly warm soups and stews. There are lots of Japanese winter foods that will keep you warm, such as oden, nabe, sukiyaki or ramen. Delicious! Are you getting hungry? 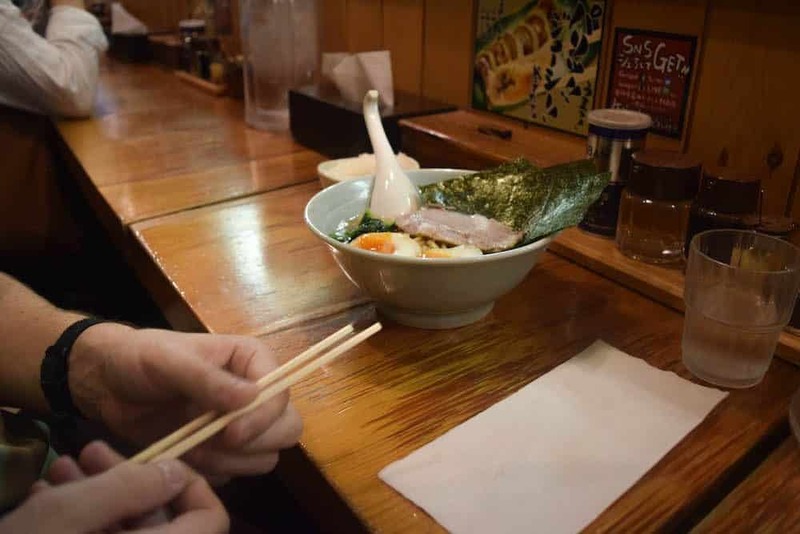 Read our ultimate foodie guide for 26 things that you must eat in Japan! Of course winter in Japan is the perfect season to drink hot sake! Winter is even the official sake brewing season. But also, it gives really makes you warm inside when you drink it. So it’s the perfect way to warm up in snowy places! Or even better: when you’re relaxing in a hot spring. That were 15 fun winter activities for Japan! Are you going to Japan in winter? Love the idea of swimming in wine! Do you know what the alleged health attributes are supposed to be? I would love to see Mount Fuji in winter. It must be breathtaking. I think Japan is a great destination all year round but especially in winter (apart from the obvious cherry blossom season). I hope I can make it there soon! Thanks for sharing. 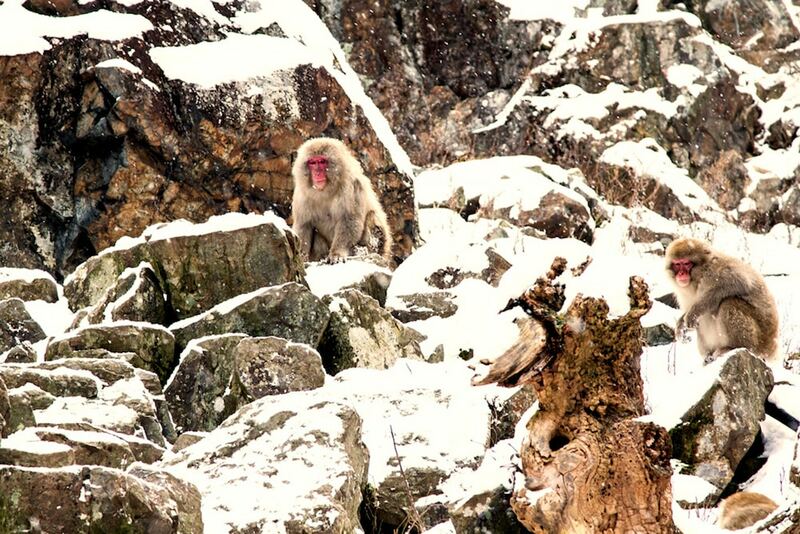 I was in Japan 3 winters ago and this post brought back memories, especially of the snow monkeys – they were so lovely!